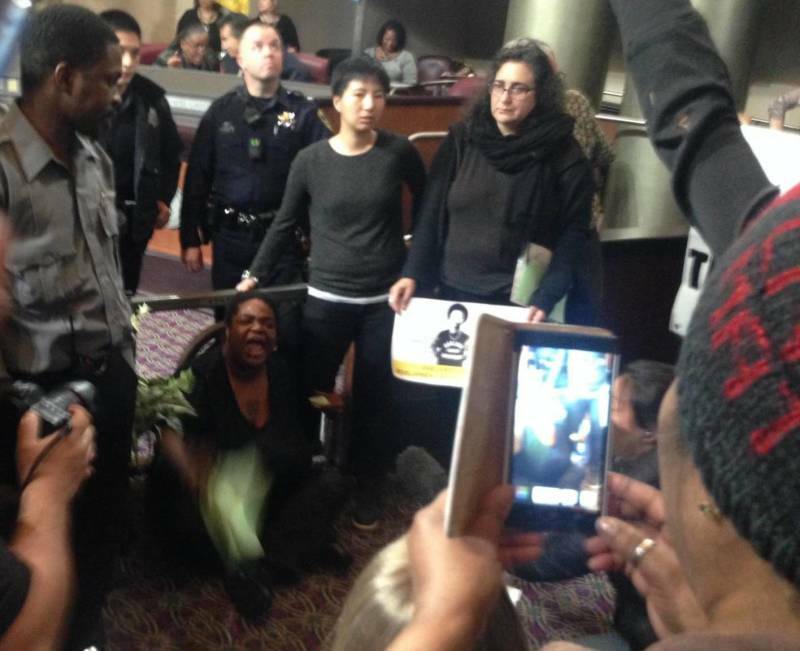 Tuesday night wasn't the first time that protesters stopped an Oakland City Council meeting before a scheduled vote on whether to sell a piece of public land on East 12th Street to build market-rate housing. This time, protesters halted the proceedings with chanting and music. Some members of the crowd chained themselves to the divider separating the council dais from the audience. But instead of shutting down the meeting, the protest merely led the City Council to move its session to a mayoral conference room, where discussion continued before the media and city staffers. The property has become a battleground for Oakland residents who worry that the high cost of housing is forcing residents out and that local politicians are choosing development over its own residents -- an idea disputed by many council members. In the end, the council's vote to pursue a 360-unit development that will include 108 affordable apartments was a compromise -- an attempt to meet community demands for affordable housing while clearing the way for a substantial new market-rate development. Last May, the City Council was planning to grant approval of a plan to sell the East 12th Street parcel to developer UrbanCore for a tower of market-rate apartments. 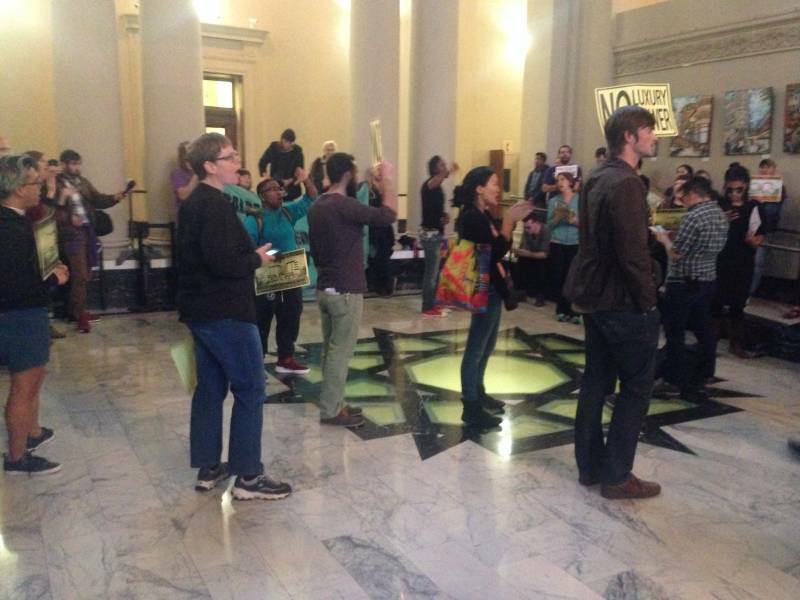 That vote was stopped by protesters who took over the council chamber. Following that meeting, the East Bay Express reported that the city attorney was questioning whether the deal was legal under the state Surplus Lands Act, which requires local government to give affordable housing developers the first crack at public parcels that are up for sale. Following that disclosure, the city retracted the UrbanCore deal and opened up the bidding to new proposals that would include at least 25 percent of below-market-rate housing. A 132-unit development by Satellite Affordable Housing Associates, or SAHA. All units in the proposed seven-story building would be below market rate, priced for those earning between 30 percent and 100 percent of the area median income. A 364-unit development from Bridge Housing and AGI Avant. The 27-story tower would include 104 below-market-rate units for those earning between 30 and 120 percent of the area median income. A 360-unit, two-building project from UrbanCore and the East Bay Asian Local Development Corp., or EBALDC. The development would include a 26-story tower and an eight-story midrise; 90 of the development's 108 below-market-rate units would be located in the smaller building. The size and the affordability of the project were not the only criteria city officials considered as they weighed the proposals. Also crucial was how much each developer would pay the city up front for the right to develop the East 12th Street parcel and how much of a subsidy they'd be seeking for developing the below-market rate units. City staff rated the UrbanCore/EBALDC proposal highest, citing the developer's offer of a high up-front payment of $4.7 million and low subsidy requirement -- $400,000. The SAHA plan, developed after a series of community meeting and called the "People's Proposal," offered the city $1 million to develop the property and would require $4.1 in subsidies for its below-market-rate units. On the downside, staff noted that UrbanCore and EBALDC are proposing an outright purchase of the East 12th parcel. That would go against a City Council policy to lease rather than sell city land. The staff recommended making an exception to the city policy to allow the UrbanCore development to go forward. 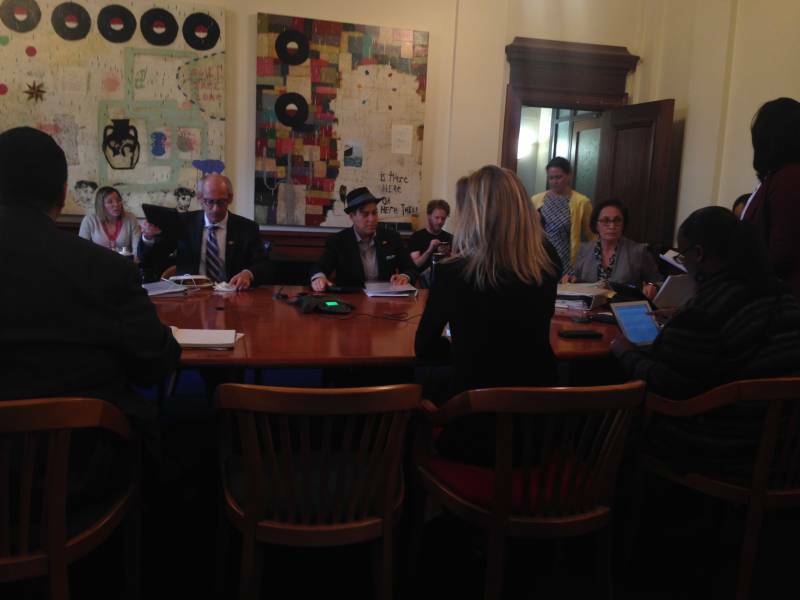 During their discussion of the issue Tuesday night, council members expressed strong support for the UrbanCore proposal. "We cannot build a wall around Oakland," said Councilman Abel Guillen, representing the district that includes the East 12th Street parcel. Guillen said despite fears that market-rate development at the site will fuel gentrification in the Eastlake neighborhood, the UrbanCore development includes housing for a wide range of incomes. "It's not perfect, but it's good," says Kalb. Council President Lynette Gibson McElhaney, who represents West Oakland, joined the meeting by teleconference and said the proposal will preserve the neighborhood's mix of higher- and lower-income households. "We see that this project will continue in the name of diversity," she says. Councilmember Annie Campbell Washington, whose district stretches from the edge of the Fruitvale through the Oakland Hills, said the UrbanCore plan combines a good range of affordability and high density -- a plus for a site near public transit such as the Lake Merritt BART Station. "This is clearly the deal that makes sense for the city," says Campbell Washington. The only dissenting voice came from Fruitvale Councilman Noel Gallo, who said he's concerned that the city is still in violation of the state Surplus Lands Act and he believes the city has an obligation to provide as many affordable housing units as it can. "I still believe that any public land that's owned by the city, that's owned by the citizens should remain with the public," Gallo said. The council voted 6-1 -- with Gallo the lone "no" vote -- to enter into a six-month exclusive negotiating period with UrbanCore/EBALDC. During that time the developers will complete approvals and requirements including holding at least two public meetings to discuss their plans.